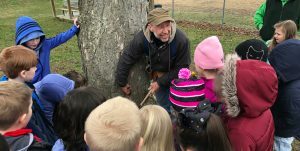 Tom Salvetti demonstrates to students how to tap a maple tree for the sap used to make maple syrup. BARRACKVILLE, W.Va. — Kindergarten and first-grade students at Barrackville Elementary learned how to make maple syrup and witness trees be tapped on their school’s campus on Monday. Pirner contacted West Virginia Department of Agriculture commissioner Kent Leonhardt in hopes of finding someone to teach the students the maple syrup process. She was then directed to deputy commissioner Joe Hatton.